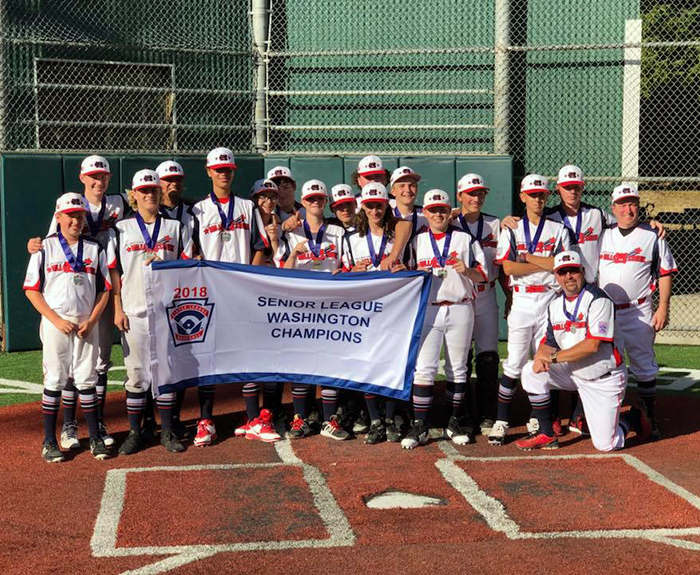 Mill Creek Little League All-Stars Seniors with Washington State Championship banner. Photo courtesy of Mill Creek Little League. Representing District 1, Mill Creek first beat Glenwood, the District 6 team, with an 11-6 score on Saturday, July 7th. Mill Creek then trounced Redmond from District 9 twice to win the championship. The score was 11-0 on July 8th, and 13-4 on July 10th. “Mill Creek Little League All-Stars Seniors grabbed an early lead in the second inning on the way to a 13-4 victory over Redmond on Tuesday. Mill Creek secured the victory thanks to eight runs in the third inning. The offensive onslaught was led by Jeremy Vierra, Eligh Wahlgren, Kayden Shaw-Fleury, Steven Verver, Xavier Wilkening-Joly, and Cameron Albright, all sending runners across the plate with RBIs. After Redmond scored one run in the top of the fifth inning, Mill Creek answered when Hayden Miller singled on a 2-1 count, scoring one run. The Mill Creek Seniors pulled away for good with one run in the second inning. Eligh Wahlgren earned the win for Mill Creek. He lasted four innings, allowing four hits and three runs while walking none. Cameron Albringht, Dominick Cantrell, and Jeremy Vierra all put in work in relief out of the bullpen, keeping their team on top. Mill Creek LL All-Stars Seniors racked up 12 hits on the day. Vierra and Albright each managed multiple hits for Mill Creek . The Mill Creek Senior All-Starts advanced to the Little League West Regional tournament in Sacramento, California. They won their first game on Thursday, July 19th, with a 10-0 shutout victory over Montana.